STUTTGART, Germany — The U.S. military’s airstrike campaign in Somalia won’t be enough to defeat Islamic militants in the country, where indigenous forces need to “step up” the fight, the commander for U.S. Africa Command said Thursday. “At the end of the day, these strikes aren’t going to defeat al-Shabab,” AFRICOM’s Gen. Thomas Waldhauser said during testimony before the Senate Armed Services Committee. 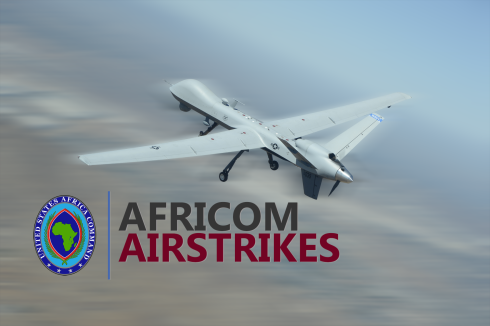 AFRICOM has picked up the pace of its airstrikes in the country, going from 35 in 2017 to 47 last year. The strikes are “causing problems” for al-Shabab, but Somalia’s own military needs to grow in size and effectiveness to counter the militant group, Waldhauser said. Still, the Marine general conceded it was “an open question” about how much the strikes are deterring al-Shabab aggression. Sen. Jack Reed, D-R.I., questioned whether AFRICOM has sufficient resources to carry on a mission of countering terrorism and Beijing and Moscow’s growing clout “with limited funds, equipment, and people.” One challenge is resources are getting diverted to the Indo-Pacific Command and European Command, where missions have grown, Reed said. Waldhauser concurred his command was under-resourced, particularly in the area of intelligence and surveillance capabilities and medical evacuation assets. In Africa, Russia has become more active as an arms supplier to various countries and provider of military training, all with an eye on getting involved in mineral extraction, Waldhauser said. “They (Russia) want to have influence on the continent,” he said. China already has significant influence in Africa, where Beijing now operates a military base seven miles away from the U.S.’s main operational hub in Djibouti, Waldhauser said. China’s investment in infrastructure and ports throughout Africa has raised concerns that it could eventually take control of Djibouti’s main port that is a logistics linchpin for the U.S. military. Such a move could potentially hobble U.S. missions across east Africa, Waldhauser said. “We need unimpeded access (to the port),” he said. While Djiboutian officials have offered assurances that it will retain control and won’t sell off to China, “the bottom line is it still remains a concern,” Waldhauser said.